Jharsuguda : Union Minister for Petroleum and Natural Gas, Skill Development and Entrepreneurship Dharmendra Pradhan dedicated state of the art oil terminals of Indian Oil Corporation Ltd. at Jharsuguda and Jatni in presence of Dr Prabhas Kumar Singh Hon’ble MP, Bargarh, Sri Naba Kishore Das, Hon’ble MLA, Jharsuguda, Smt Radha Rani Panda, Hon’ble MLA Brajarajnagar, Shri Sanjiv Singh,Chairman, IndianOil, Sri B S Canth Director (M) and other dignitaries. The Paradip-Raipur-Ranchi pipeline also dedicated to the Nation. Speaking on the occasion Shri Pradhan praised the projects, referring to the contribution to the success of the economic development plans of Eastern India of Prime Minister Mr Narendra Modi. He said “These new facilities will further strengthen storage and distribution of petroleum products in the states of Odisha, Jharkhand and Chattisgarh”. 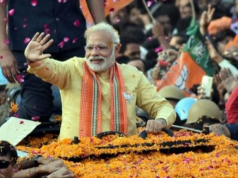 Sri Pradhan said more than 22000 LPG gas connections distributed to BPL families in Jharsuguda district under Pradhan Mantri Ujjwala Yojana. He proposed for availability of natural gas in Jharsuguda district through pipeline which will be conecting to Dhamra Natural Gas Regasification plant. Accelerated development of the Eastern States has been the focus area for the Government of India. 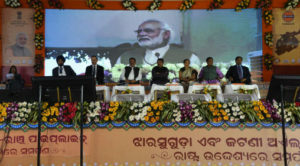 Prime Minister, Shri Narendra Modi, while dedicating the 15-MMTPA Paradip Refinery to the nation, termed it the Vikasdeep of Eastern India. The integration of the Paradip refinery with Jatni and Jharsuguda Oil Terminals through Paradip-Raipur-Ranchi Pipeline in Odisha will be an enabler for faster evacuation of petroleum products from Paradip Refinery. The Paradip-Raipur-Ranchi Pipeline is further connected to Ranchi Oil Terminal of Jharkhand and Korba and Raipur Oil Terminals of Chattisgarh. The total project cost for these projects is about Rs.2800 crores. These facilities will aid in meeting the growing demand of Petroleum products leading to faster development of the region. Sri Sanjiv Singh Chairman Indian Oil had welcome and addressed the gathering. 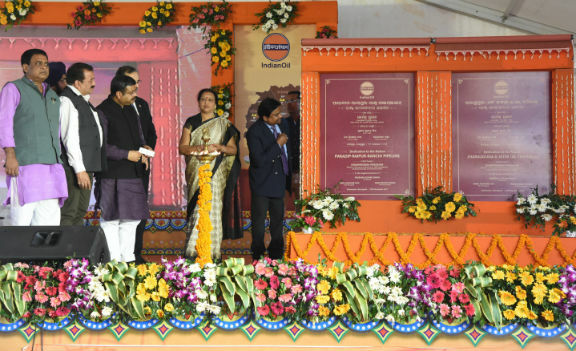 He said the biggest and smart automated oil terminal of Odisha at Jharsuguda is yet another important milestone for uninterrupted, automated delivery of fuel supply to 10 District of West Odisha– Bargarh, Bolangir, Deogarh, Jharsuguda, Keonjhar, Kalahandi, Sundergarh, Sambalpur, Sonepur & Nuapada. The terminal at Jharsuguda is part of the Government’s continuing endeavour to build a world-class & automated oil terminal in the Odisha. The fully automated terminal at Jharsuguda at a total investment of Rs.140 Crore is having the facilities of safe and efficient Bottom loading facilities, automated Quality and Quantity control, Scheduling and Tank Farm management. The project boosted in generating enormous employment in Odisha indirectly in terms of haulage & housekeeping, security, maintenance, canteen and tank truck crew etc. Total tankage capacity is 49000 Kilo Litre (Coverage 22 days) with 2200 KL per day sale of Petrol, Diesel and Kerosene to cater more than 350 sale points (245 nos. ROs, 114 nos. consumers and 27 nos. SKO agencies) round the year supply. Similarly, the renovation of Oil depot, Jatani at a cost of Rs 70 crore is enabled for catering 13 districts of Odisha i.e. 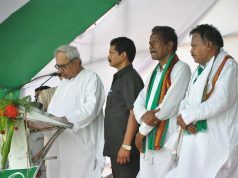 Angul, Boudh, Cuttack, Dhenkanal, Ganjam, Gajapati, Khordha, Nayagarh, Puri, Phulbani, Rayagada, Malkangiri and Kalahandi. These projects receive product through 1073 km length Paradip- Raipur -Ranchi Pipeline. 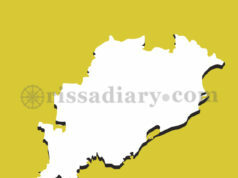 634 kms of this pipeline in the state of Odisha has been set up at an investment of Rs 1100 crore. The total investment in the three projects i.e. Jharsuguda, Jatni Oil Terminals and Paradip Raipur Ranhi pipeline within Odisha is Rs 1310 crore. The vote of thanks was given by Sri Pritish Bharat , Chief General Manager, Odisha State Office.